Career Fairs provide a forum for students and employers to meet and talk informally about full-time, part-time, volunteer, and internship opportunities and to identify candidates to interview on campus. Career Services hosts several all-university career fairs each year, as well as specialized fairs geared toward specific industries, internships, and graduate school selection. 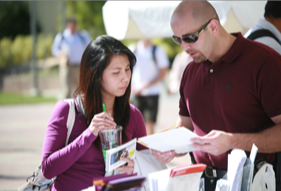 SDSU's diverse student body makes these events outstanding recruiting venues. These fairs are excellent opportunities for employers to connect with a high volume of students to discuss jobs and career opportunities — as well as make contact with faculty and other key campus personnel. See the details about upcoming Career Fairs. Contact Career Services at (619) 594-4376 to check venue availability and fees before submitting your request. Employers, explore our Aztec Opportunity Alliance Program (PDF; download Adobe Acrobat Reader, if needed) to see how you can increase your visibility and recruiting power on campus! Let us help you build your brand on campus. Tabling is a strategy for building your organization's brand on campus by hosting a "career fair for one." To take advantage of this year-round opportunity, start by registering on Aztec Career Connection. Fees apply.